Go back to school with Lori Holt of Bee in my Bonnet's fourth book. 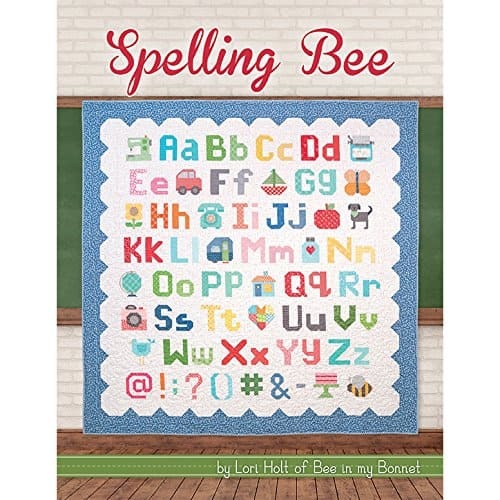 Spelling Bee includes complete instructions for 100 letter, number, punctuation and picture blocks in two sizes (6 inches and 12 inches) PLUS 18 quilt projects. There are over 190 pages of full-color instructions, beautiful photos, and general schoolhouse fun. Lori Holt of Bee in My Bonnet is a small town farm girl who spent her childhood playing in the sunshine on tractors and climbing trees. She grew up happily immersed in all things domestic. She draws inspiration from the beauty of the earth and from the love of God and family memories.